NCR Corporation (NYSE: NCR) reported financial results today for the three months ended March 31, 2010. Reported revenue of $1.03 billion increased 2 percent from the first quarter of 2009 and included approximately 5 percentage points of benefit from foreign currency translation. NCR reported a firstquarter net loss attributable to NCR of $19 million, or $0.12 per diluted share, compared to a net loss attributable to NCR of $15 million, or $0.09 per diluted share, in the first quarter of 2009. Net loss attributable to NCR in the first quarter of 2010 included $56 million of pension expense ($40 million or $0.25 per diluted share, aftertax) and $5 million ($3 million or $0.02 per diluted share, aftertax) of incremental costs related to the relocation of the Company's global headquarters. Net loss attributable to NCR for the first quarter of 2009 included $38 million of pension expense ($25 million or $0.15 per diluted share, aftertax) and a $5 million ($3 million aftertax) impairment charge related to an equity investment, which was offset by a $5 million ($3 million aftertax) benefit from an insurance settlement related to the Fox River environmental matter. Excluding these items, non-GAAP earnings per share(1) in the first quarter of 2010 was $0.15 per diluted share compared to $0.06 in the prior year period. "First quarter revenue and nonpension operating income growth, coupled with improving margins and balanced order growth give us increased confidence in 2010," said Bill Nuti, chairman and chief executive officer. "Our further execution on sustainable productivity improvements has also allowed us to keep pace with our cost reduction initiative. In addition, today we announced a definitive strategic plan to address the underfunded status of our pension plans. We anticipate that these planned actions will lead to greater visibility into our operating performance as we pursue our longerterm growth objectives." Financial highlights - Yearoveryear revenue comparisons benefited from improvement in global economic conditions generally and the resulting impact on the global financial services industry and the retail and hospitality industries. Revenues grew 24 percent in the Asia-Pacific-Japan (APJ) region due to higher sales in both the financial services industry and the retail industry. Revenue in APJ was positively impacted by 12 percent due to foreign currency translation. Revenues rose 1 percent in the Americas region as increased revenues from the entertainment business were somewhat offset by lower product sales to customers in the financial services industry and the retail and hospitality industries in the United States, the Caribbean, and Latin America. Revenues in the Americas region were positively impacted by 2 percent due to foreign currency translation. In the Europe/Middle East/Africa (EMEA) region, revenues declined 6 percent due primarily to lower product sales to customers in financial services across the region. Product sales to the retail and hospitality industries also declined in EMEA, while revenue was positively impacted by 5 percent due to foreign currency translation. NCR generated $14 million of cash from operating activities during the first quarter of 2010 compared to $38 million in the yearago period. Net capital expenditures increased to $51 million in the first quarter of 2010 from $25 million in the yearago period, primarily due to investments in the entertainment business. NCR generated negative free cash flow (cash from operations less capital expenditures)(3) of $37 million in the first quarter of 2010, compared to free cash flow of $13 million in the first quarter of 2009.
Business highlights - In the first quarter of 2010, NCR continued the integration of its services business into the Industry Solutions Group which is comprised of NCR's Financial, Retail, Entertainment, Travel and Gaming, and Healthcare solutions offerings. In the first quarter, NCR also deployed its industryleading selfservice technologies across the entertainment, travel and retail markets and drove increased penetration of its core ATM solutions. NCR further advanced its entertainment kiosk strategy during the first quarter, adding Sheetz convenience stores to its growing roster of retail partners. 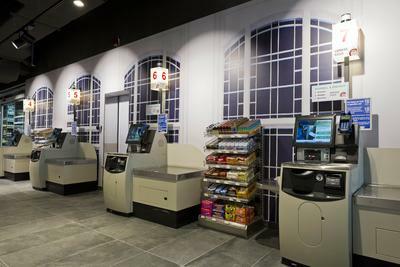 Consumers can now visit NCR's BLOCKBUSTER Express(TM) branded DVDrental kiosks at nearly all 365 Sheetz locations which are open 24 hours a day. This represents NCR's first major BLOCKBUSTER Express kiosk deployment in six new markets located throughout North Carolina, Ohio, Pennsylvania and West Virginia. The kiosks will be located outside Sheetz stores. NCR's outdoor kiosks are optimally designed for Cstore locations that welcome customers 24 hours a day but have limited space. Also in the first quarter, NCR made renting a DVD from BLOCKBUSTER Express kiosks faster and easier by allowing customers to rent DVDs online at blockbusterexpress.com. Through the new rent online feature at blockbusterexpress.com, customers can create a favorites list, browse available titles at their preferred kiosk, complete the rental of up to three titles at once online and then pick up their DVDs from the kiosk at their convenience. These new rent online features enhance the home entertainment experience by allowing movie fans to spend less time renting and more time enjoying their DVDs. NCR and InMotion Entertainment announced a partnership which will result in MOD digital kiosks being installed in InMotion retail locations located in major airports across the U.S. The kiosks are designed to store thousands of video titles including movies and TV shows, and a host of other media including millions of music titles, travel videos, games and ebooks. InMotion currently has 57 stores located in 35 airports constituting an attractive deployment footprint with heavy consumer traffic, consumers with time voids, and a lack of alternative entertainment options. NCR expanded its travel business by enabling TACA International Airlines (TACA) to give passengers greater checkin convenience on the web and at the kiosk. TACA, recognized by SkyTrax in 2009 as the best airline in Central America, is taking selfservice convenience to the next level by deploying a selfservice enterprise software solution from NCR that enables passengers to manage a broad range of checkin services. 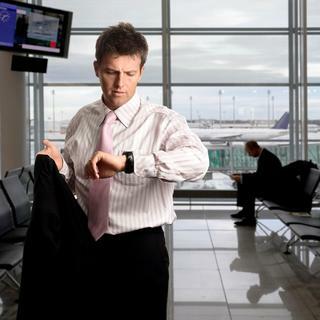 TACA is the first airline in Latin America to deploy the new fullfeatured selfservice checkin software solution from NCR. In the retail vertical, NCR announced a new release of its NCR Netkey digital signage solution, designed to help companies connect better with their customers by simplifying content management, delivering richer content and supporting Windows 7 for Embedded Systems. Available as either licensed software or as a Softwareasa-Service (SaaS) subscription, the new release marks the first enhancement delivered since NCR's acquisition of Netkey in October 2009. NCR also reaffirmed its commitment to deliver to market further digital signage enhancements as an integral element of its extensive suite of consumerfacing solutions. In healthcare, NCR announced that Healthy Advice Networks, the nation's leading provider of physician officebased health education programs, is using NCR Netkey to power its PracticeWire(TM) service. PracticeWire delivers realtime health content to physicians throughout the United States via wallmounted digital screens enabled with wireless broadband. NCR Netkey provides Healthy Advice Networks with a centralized, Webbased digital content management solution that utilizes administration tools to schedule and deliver highlycustomized educational material directly to physicians. The Methodist Hospital System (TMHS), named by U.S. News and World Report as one of America's Best Hospitals, is further improving the patient experience by employing selfservice online, mobile and kiosk solutions from NCR to do everything from making an appointment to settling outstanding balances. Studies show that offering this added convenience can have a significant impact on patient loyalty. A 2009 survey of U.S. consumers commissioned by NCR reveals that 72 percent of patients are more likely to choose a healthcare provider that offers the flexibility to interact via online, mobile and kiosk selfservice channels. NCR expects fullyear 2010 revenues to increase in the range of 2 to 5 percent on a constant currency basis compared with 2009. Including the continuing investment in its entertainment portfolio, the Company expects its fullyear 2010 Income from Operations (GAAP) to be $90 million to $110 million, Nonpension operating income (NPOI)(2)to be in the range of $310 million to $330 million, GAAP diluted earnings per share to be $0.39 to $0.49, and non-GAAP diluted earnings per share excluding pension expense(1)to be in the range of $1.35 to $1.45 per diluted share.The 2010 non-GAAP EPS guidance excludes estimated pension expense of $215 million (approximately $151 million aftertax) compared to actual pension expense of $159 million ($108 million aftertax) in 2009. NCR expects its 2010 effective income tax rate to be approximately 27 percent for the full year. The Company expects Q2 2010 pension expense of $50 million to $55 million (approximately $34 million to $37 million aftertax) compared to actual pension expense of $39 million ($29 million aftertax) in the second quarter of 2009. Including the continuing investment in its entertainment portfolio, the Company expects second quarter 2010 nonpension operating income(2) to be in the range of $75 million to $85 million. NCR estimates its Q2 2010 effective income tax rate to be 35 to 40 percent, as the second quarter effective tax rate is typically higher than the full year effective tax rate. A conference call is scheduled today at 4:30 p.m. (EST) to discuss the company's 2010 firstquarter results and guidance for fullyear 2010. Access to the conference call, as well as a replay of the call, is available on NCR's Web site at http://investor.ncr.com/. Presentation materials that include supplemental financial information regarding NCR's first quarter 2010 operating results and capital allocation strategy are also available on NCR's Web site. NCR Corporation (NYSE: NCR) is a global technology company leading how the world connects, interacts and transacts with business. NCR's assisted- and selfservice solutions and comprehensive support services address the needs of retail, financial, travel, healthcare, hospitality, entertainment, gaming and public sector organizations in more than 100 countries. NCR (www.ncr.com) is headquartered in Duluth, Georgia.